Summer semester is going to be REALLY busy, so I'm pretty incognito on the social networks. I do still get to read my RSS feeds though and will be sharing the ones that make a big impression on me. "BREAKING NEWS: A German court has ruled that non-medical circumcision is a "serious and irreversible interference in the integrity of the human body." Says Holm Putzke of the University of Passau, "This decision could not only affect future legal rulings but in the best case it could lead to a change of consciousness among the affected religions when it comes to respecting the basic rights of children." I'm reading out of order, as I find them. The art is clean, with a simple feel with nice detail. There's an "art book" section in the back that's pretty cool. Someone tore a page out of this edition, jerks. My favorite panel is on Vol3.16(? ), page 26 in the Archer's Quest compendium, with both Green Arrow and Arsenal (4.0, with the orangey arrow/maple leaf thing on the front). Scanned and added below, because it's just too cool. The story is outstanding. The concept is really cool, and I love how the author outlines how they came up with it in the back of the volume. I love how it manages to pull together elements from, seemingly, every aspect of Ollie's life. Learn a couple new things, get to see some really old things, very cool. 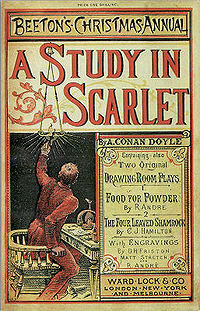 I wanted to wait a couple days before I reviewed it, because I became unbelievably fangirly after seeing Sherlock. Here it is, 2 days later, and no sign of it subsiding. I'm twitterpated. Therefore this is less of a review of the series and more of a squee. I watched the first season in a run, all back to back. I couldn't connect how it became so late in the day, when I was done, and wanted to know why there were only three episodes! It was so riveting that I didn't even NOTICE that the episodes where 90 minutes long. I was posting Twitter like updates on my FB, for no other reason other than I can (and I like to take notes). Pretty sure I was hooked when the cop told John that Holmes was a psychopath. I rolled my eyes and told the screen that he ISN'T a psychopath, just a sociopath. About ten minutes later, when John related it to Holmes, Holmes said the same thing. A high-functioning sociopath. I squeed. Review: A Study in Scarlet, Nancy Drew #2,#3. It wasn't so surprising when Sherlock makes the nab, and very cool in the way he does it, but then the story suddenly transforms into a completely different storyline. I was reading by audio and I honestly wondered for a moment if I'd somehow got the wrong disc, for a different book, or something. I actually became momentarily frustrated: while not an uninteresting story, it wasn't the story I wanted, I wanted deduction, not cowboys and Mormons. Only realizing the two suitor's names returned me to patience. Then, the purpose of the crime made sense, even if the crux hadn't occurred yet. From frustration to appreciation of the intricateness of the whole thing. It did feel like a little more background information that strictly necessary, to the point of seeming superfluous. When a summary review (this time, the Wiki summary) says "significant flashbacks" MAN they mean it. Film: Captain America (2011). I, yep, Loved it! It wasn't a comedy but it was hilarious. The dialogue was fantastic! I was also edge of my seat the whole time. And almost teared up at the end. Fantastic movie. A little fact-checking on Rogers' Class-A ribbons... I hate when movies get them wrong, because they're so damned easy to look up! If you don't care about ribbons, skip to the next photo. Finally: Thor (2011). I love it! DUDE! Prince Charming (from once Upon a Time) is the cavalier. Rawr.Aaaaaand of course. They red shirt him. Scratch that, healed. Turns out he's "Fandral". Also turns out he's based on Errol Flynn. I like him already ;)OMG HAWKEYE (I knew it. As soon as the hands didn't choose the sniper rifle.)Lawl. "Is that one of Stark's?" :DOh, please tell me chucking Volstagg was an homage to LotR's dwarf tossing...Aaaaaad that's why you stay for the goodies after the credits :D Thor was another comic I had zero contact with growing up. I assigned red-shirt status to the gorgeous cavalier because I didn't hear him have a name when Thor was remembering glories in the Hall. Turns out I just missed it. His wiki (because even superheros have wiki's!) says that Stan Lee based his personality on the persona Errol Flynn had in public. Totally has an unfair advantage over the other characters already. Finally saw Harry Potter and the Half-Blood Prince (HP6). Note: there's a tiny spoiler in the review, but it's not really a review, mainly a canon-snob rant. I really enjoyed the movie, though I don't like what they left out slash added. 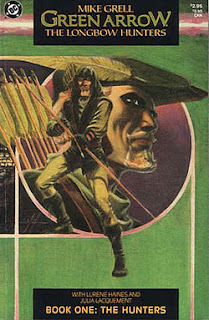 BookWyrm: Green Arrow: Longbow Hunter Trilogy. I haven't reviewed a comic or graphic novel here before, because I don't read a lot of them anymore. So, first let me tell you why I love them. Had a lot of free time this past week so I tried to use it to catch up on old hobbies: namely reading and watching movies. I finished rereading Harry Potter and the Half Blood Prince (HP6), 5/5!. When I watched Order of the Phoenix (HP5) I realized I'd forgotten a lot. I read the 2-3 at a very busy time in my life and wanted to reread the last two before I saw the movies. I'm really glad I did. It's been five years since I read it, and I knew how it was going to end, but I couldn't help crying anyway. It really is wonderfully written. I did find myself really tired of listening to Harry though: his obsessions are getting really out of hand, to the point where it seems like Hermione's the only one making any progress. This feeling spawned someone else writing "In Praise of J.K. Rowling's Hermione Granger series" which is really quite funny. Trying to catch up on some Avengers movies before I go see the coup de grâce next week. I already wrote my response to Iron Man, as well as I could without leaving drool marks on the screen. I had to decide which Hulk to watch since there have been a few in the last decade or so. I tried to base it off the upcoming Avengers flick. Though there's a new actor playing Hulk the decision came down to the writer: the 2003 screenplay was written by Stan Lee, the 2008 one was not. Bam, easy. Then there was FINDING it. Do you know how hard it is to find the 2003 Hulk on DVD somewhere I could travel to rent it? Strangely enough, very difficult. Anyway, I persevered. I've had some time this summer to catch up on reading, and I find my Goodreads link is pretty much spamming my blog... SO, in an effort to keep things a little more shipshape I'll be posting my reviews omnibus style under the label Library (or BookWyrm, I haven't decided yet). I took a 36 hour Greyhound bus trip (one way) to see my parents this summer, and had a LOT of time to read, especially since I had to go home again too! Movie: Iron Man; I loved it! I think I held my breath through most of it. Fantastic. Absolutely loved it. Maybe a little too much. 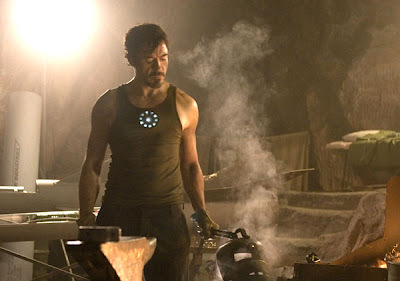 A. Robert Downey Jr (who makes a fantastic Sherlock) portray one hot-diggity-damn Tony Stark. B: JARVIS! I'm sorry, but that's Paul Bettany in there, and I love that guy. Have since he was Dr. Stephen Maturin, Surgeon, Naturalist, in "Master and Commander: Far Side of the World". C: Stan Lee as Hugh Heffner (rock on). E: Pepper Potts. She's pretty much a superhero on her own. What do you have to do to be the "administrative assistant" to a guy that brilliant? I want to see her resume and transcripts. I love her character!